1. Winkie has been charged with a series of bombings that took place over the past 11 years. 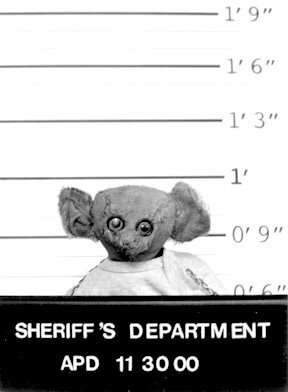 But before the bear's arrest, the FBI's Most Wanted List described the person responsible for these crimes as a middle-aged man, medium build, about 6 feet tall. 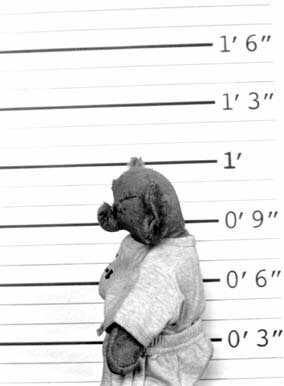 As the mug shot clearly shows, Winkie is of indeterminate gender, quite old, of slight build, and barely a foot tall. i would give notice of the "evil teddy bear" argument. you always need an alternate theory of the crime. like o.j., winkie won't stop until he finds the real killer. in fact, a middle-aged man, medium build, about six feet tall sounds like o.j. himself. is winkie into portugese poetry? i am impressed. bookfraud: 1. winkie has eclectic literary tastes but likes joni mitchell best. 2. we should have mentioned that the mad bomber was also believed to be white, whereas winkie is light brown. 3. we don't believe winkie is evil, though we understand why s/he might like to be.